Happy Friday! As promised, here is the first installation of our Free Pattern Friday. 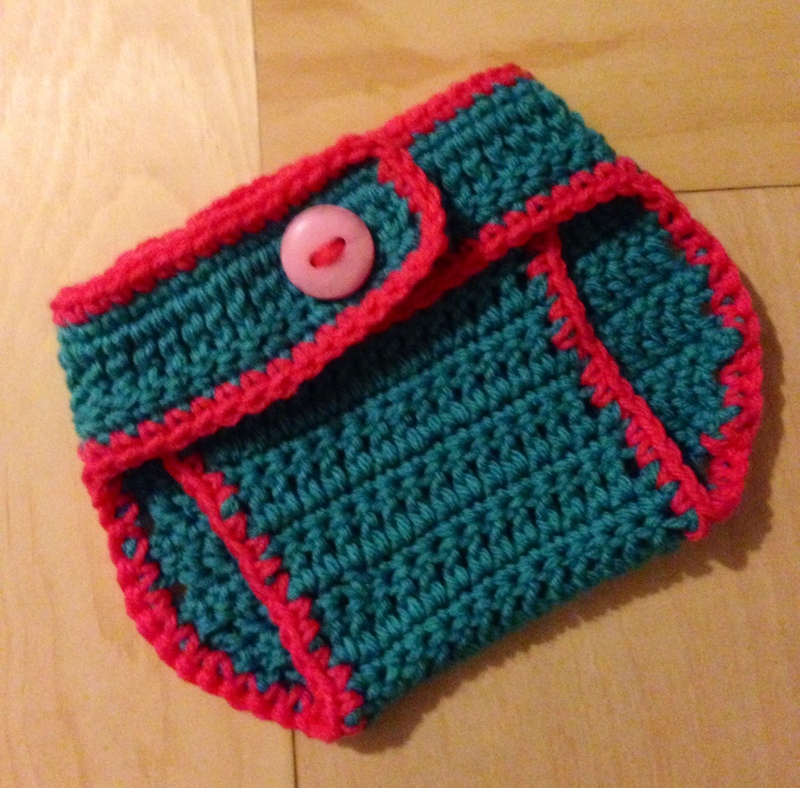 Today’s free pattern is an adjustable diaper cover. What makes it adjustable? The fact that you will be adding a button (or similar embellishment) on the waist band which will be worked in triple crochets. The triple crochets will act as a button hole and can be adjusted as needed. This will comfortably fit a 0-6 month old baby. Triple crochets in row 2 will be the button holes which will make the diaper cover easily adjustable. R3: sc in each st across. Fasten off. Weave in ends. With contrasting color, join with slip stitch to any st. ch1. Sc around. Fasten off. Weave in ends. Sew large button to center panel. Love it! Do you mind if I share your site with the ladies in my crochet group on my site? This crochets up really nice and is super cute! However I did find that chaining 3 made my edging too loose and didn’t line up properly, I did find chaining 2 was a lot tighter. I don’t know if any one else happen to run into this issue as well. I also did the chain two. It worked up cleaner for me that way! I found the same thing to be true! I changed it to chain 2 as well. Can you provide a gauge for the adjustable diaper cover? I wanted to make it for a year old baby. Thanks in advance. Quick and easy, clear directions. Will put flower around button for girl. Thanks. I just completed this item. It works up fast and easily. Thank you for sharing the pattern. Is the pattern written in US or UK terms?